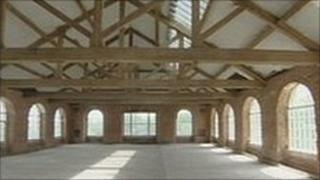 Plans to convert a 200-year-old textiles mill into 135 houses and flats have been approved by Stroud District Council. Stanley Mill, a Grade I listed building in Stonehouse, stopped production in the 1980s. The current owners want to sell it as they cannot afford the upkeep. Councillor Nigel Studdert-Kennedy said the need to renovate the building had outweighed anticipated concerns about traffic problems from new homes. Plans for the mill also include a new factory building and parking. Mr Studdert-Kennedy said some people felt the new homes would increase traffic problems around a narrow bridge over the river. But he said: "The other side of this is if the mill falls into disrepair and becomes a site for people to go who shouldn't be there... people are going to ask us why we didn't do something about it. "It's probably making the best of a poor situation and the result may yet turn out to be complimentary rather than detrimental." Phil Skill, the council's head of planning, said: "I think it's a very balanced decision members had to make to save a Grade I listed building of national importance. "With the strain on public monies, the only way we are going to get these listed buildings renovated is through the use of commercial money and, in those sort of circumstances, you have to take the steps that we have done today."